I have very fond memories of Borders. And soon, memories will be all we have. There are conflicting reports on when the local outlet at Arbor Place will go dark, joining many other stores nationwide in what has been heralded as one part changing of the times, and another part catastrophic mismanagement and poor decision making. But, going dark it will, perhaps even as soon as tomorrow as its corporate master liquidates its holdings to pay debts and leaves another big box to blight the city of Douglasville. Before Borders, there was Douglasville Books. It was in a storefront next to Wal-Mart, when Wal-Mart was on Stewart Parkway across from the post office. It was a prime location, and the place where much of my library originated. I collected my Goosebumps books there, and build a shelf full of thrift copies titles I thought would be useful to have someday. I endured the heat of a summer escaping into the works of Jack London, collected from a Douglasville Books bargain bin. In today’s Douglas County Sentinel, mall manager Bill Ball indicates that Arbor Place had already been moving to fill the prime space that Borders occupies once the retailer was no more, figuring that the company’s demise was just a matter of time. But Ball would say no more, except that – depending in part on when Borders does depart – that the space could be filled as early as the first part of 2012. 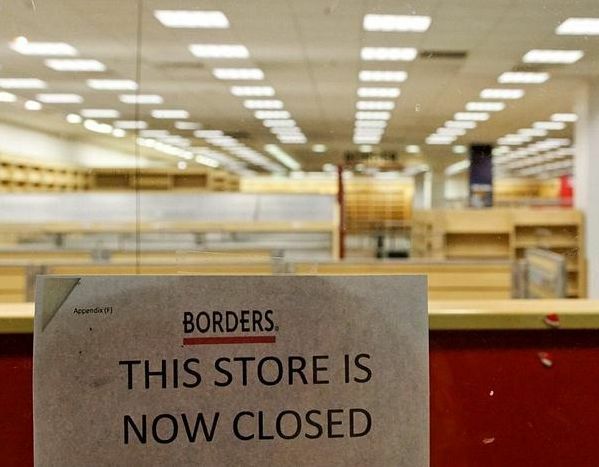 I, personally, have hoped that Barnes and Noble would wedge itself into Borders’ old space. But from what I’ve read (and I’ve read a bit), B&N isn’t all that interested in inserting similar product into failing locations and investing in the leasing and staffing of brick-and-mortar stores that are already in heated competition with low-overhead online dealers, the king of which is Amazon. Barnes and Noble always seemed to offer a superior experience over Borders, which felt that it was trying to do too much with too little. I bought a good deal of music from Borders – nearly all my jazz CDs came from the store, which led me down a path of weekly purchases that began with Miles Davis and ended a couple of years ago with an album from Dexter Gordon. Having worked – albeit briefly – at Media Play, I was wise to the high-profit impulse purchases located near the register, and refrained from the overpriced chocolates and bookmarks and batteries (which perhaps makes me somewhat responsible for Borders’ demise). But the availability of Starbucks, the large paintings of famous writers on the wall and the vast selection of book titles put Barnes and Noble way, way ahead in where I’d rather spend my time, and my money. It was even, when we had the extra financial resources to spare, worth it for us to pay the annual subscription for Barnes and Noble’s VIP program, because the discount we got on the number of books we purchased paid for itself and then some. And Barnes and Noble engaged the readers. When we drove to Buckhead to meet my wife’s favorite author, Laurell K. Hamilton, the venue was a Barnes and Noble. And my wife’s autographed copy of Hillary Clinton’s biography was signed also at a Barnes and Noble. In our first apartment, a very happy afternoon was one in which we made the drive from Hiram into Cobb County to the nearest Barnes and Noble, to browse and drink coffee, then come home to spread out on the couch and read until late into the night. Many have speculated that the site would be ideal for a Barnes and Noble or a Books-a-Million – and to be sure, the Douglasville location was one of the more successful Borders stores, in all likelihood, in a sizeable city now without a major book retailer – but the notion seems increasingly silly. But then, with a resurgence forecasted for independent book retailers with Borders out of the way, maybe Douglasville Books – which Borders opening and the relocation of Wal-Mart had pushed to a used bookseller in a small storefront on Douglas Boulevard near Walgreen’s – might make a grab for the space and open a whole new kind of independent bookstore concept there, like a phoenix rising from the ashes to a glory greater even than its original incarnation. You could walk in, be greeted almost immediately by a knowledgeable fellow-bibliophile who served you a cup of coffee and talked you through the book selections, or left you to wander on your own as you might desire, sorting through tomes and titles with the kind of instant gratification that Amazon could never provide. Oh, and be sure to offer the buy two, get one half-off deal on trade paperbacks that Borders did that I found so utterly impossible to turn down. Such wonderful possibilities! Or it could become another outlet selling college athletics merchandise. But hey, one can always dream, right? I loved Douglasville Books — Babysitter’s Club, not Goosebumps, for me.